And The Total Spent On Health In Impoverished Countries Last Year... : Goats and Soda ...is $228 billion. A new report breaks it all down: Who gave the money (spoiler alert: the U.S. is a very big donor) and where did it go? A big chunk of it comes from the U.S.
Those are three things you'll learn from the sixth annual report on how much money has been spent to improve health in developing countries. The total in 2014 was $35.9 billion. As impressive as that number sounds, it's a 1.6 percent drop from 2013. The U.S. contribution: $12.4 billion. Of course, many other countries chipped in, along with public and private organizations. The report comes from the Institute for Health Metrics and Evaluation (IHME) at the University of Washington. Dr. Joseph Dieleman, assistant professor and lead author of the study, spoke with Goats and Soda to provide context. The interview has been edited for length and clarity. 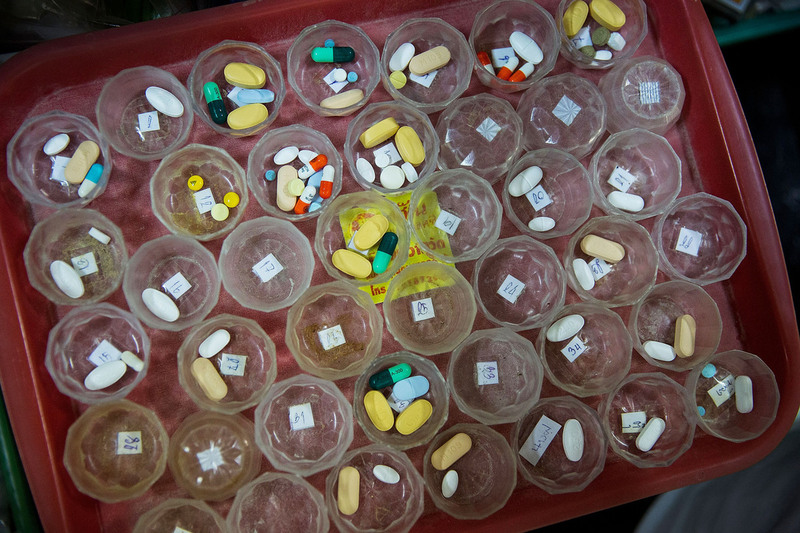 Pills are prepared for HIV/AIDS patients at a caregiving facility in Thailand. A new report on global health spending shows HIV/AIDS is the top priority. One thing we could never do with our data in previous years is link where the money is from, through the intermediary channels [institutions like the World Health Organization that provide assistance for global health efforts] and then how much money goes into which area. In 2014, for example, 30 percent of development assistance in health went toward HIV/AIDS — about $11 billion. Sixty-three percent is coming from the U.S., which has put significant resources in programs like PEPFAR (The United States President's Emergency Plan for AIDS Relief). From 1990 to 2014, a total of $458 billion of development assistance has been provided to improve health in developing countries. Is that enough? Certainly not enough in the sense that there are diseases that have known cost-effective interventions that still lead to premature mortality throughout the world. That strikes me as evidence that more could be done. Our report essentially lays the groundwork for these discussions. If you don't know how much is being spent, there's no way to have that conversation about the effectiveness of development assistance in a meaningful way.